Heading off our monthly round-up of the hottest gadgets from Asia is Sony's Party-shot, which attempts to make the cameraman obsolete -- or at least a little less necessary. 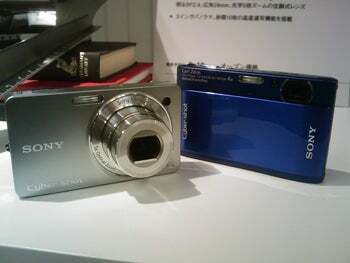 The device is coming with a couple of new digital still cameras that also bring improvements on previous models. But Nikon takes the prize for the most innovative camera of the month with its projector-equipped Coolpix. Many of Japan's gadget makers are taking mid-year holidays but that hasn't stopped some from unveiling a few innovative products this month. Read on for more. Have you ever been to a party only to spend half your time taking pictures of other people? If so, Sony has something for you. Party-shot is a dome-shaped device that is designed to be used with a couple of new cameras (see below), and includes motors and runs on a pair of AA batteries. The camera's facial recognition software monitors its surroundings for faces and instructs the Party-shot base that it's mounted on to move around so it can aim and frame before automatically taking a snap. The idea is that you leave the camera and Party-shot running during a party and at the end have a card full of pictures. During a demo, results were mixed. The pictures were a mixture of good, funny and bad, but not too bad considering that no effort was involved. The Party-shot will go on sale in Japan on Sept. 4 and costs ¥14,910 (US$157). To coincide with the launch of the Party-shot, Sony is releasing two new cameras both of which use Sony's 10-megapixel "Exmor R" image sensor that has better sensitivity than previous sensors, so it works better in low-light conditions. The Cyber-shot TX1 is a stylish and slim model at 14 millimeters thick and comes with 4X optical zoom and a 3-inch touchpanel screen. 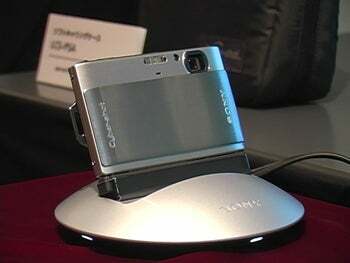 The second camera, the Cyber-shot WX1, has a conventional 2.7-inch display and 5X optical zoom. They also have Sony's "Sweep Panorama" feature that allows for super-wide panorama shots. The TX1 will launch on Sept. 4 in Japan and cost around ¥43,000 and the WX1 will go on sale on Sept. 18 and cost ¥40,000. In the U.S. the TX1 will be available in September for $380 and the WX1 in October for $350. The Bowlingual, a gadget that analyzes a dog's bark to detect its emotion, is back and this time it speaks. The Bowlingual was developed in collaboration with an audio researcher and analyzes the acoustics of a dog's bark. It is said to be able to recognize and convey six basic emotions. 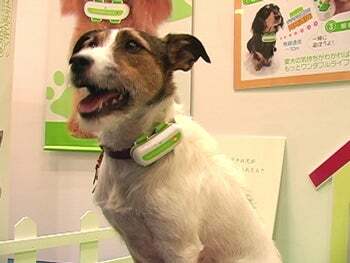 It consists of two parts: a microphone worn around the dog's neck and a handheld unit that receives data from the microphone, determines the emotion and then displays a corresponding phrase on the screen for the owner. The new version has a smaller handheld unit and packs a built in speech synthesizer and will cost just under 20,000 yen (US$213). It will initially be available in Japan only. There's no word on when it might be available outside Japan. Running out of power while on the road is frustrating but a new portable solar charger from Sanyo could help. The Eneloop Solar Charger combines a portable solar panel with a Lithium Ion battery pack and can be used to charge gadgets via USB. It should work with many portable products including cell phones, music players and portable game devices. 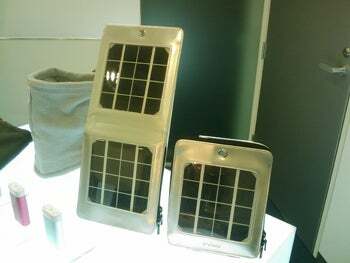 Two versions will be available, one with a single solar panel and one with two panels. Both charge the Lithium Ion battery-based "mobile booster," which acts as an energy reservoir and is needed because the panels don't provide enough power to directly power a gadget. A one-hour charge should provide enough power for at least 20 minutes of talk-time on a cell phone. The panels are on sale now and cost ¥9,000 (US$93) for the single panel model and ¥14,000 for the twin-panel model. Overseas launch details were not announced. The fourth and latest member of LG's design-conscious Black Label family of handsets will be out soon. The phone, dubbed the BL40 New Chocolate, is the first to have a widescreen 21:9 aspect ratio screen, which is 4 inches in size and has 345 by 800 pixel resolution. That makes the screen longer and thinner than the 16:9 displays found on many new TVs and monitors. It also has a 5 megapixel camera, GPS, and multi-touch support, plus all the scheduling, contact and other functions expected in cell phones today. Release and price will vary by carrier and market but it should start appearing soon. The first digital still camera with built-in projector is on the way from Nikon. 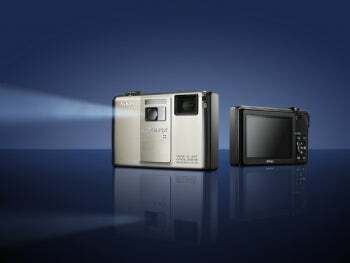 The Coolpix S1000pj can project a still or video image over a distance of about 2 meters for a picture about the same size as a 10-inch screen. It also has a 12-megapixel image sensor, 5X optical zoom (28mm to 240mm), a 2.7-inch-diagonal LCD, and ISO levels of up to 3200 at full resolution (as well as ISO 6400 at a 3-megapixel resolution). The camera will launch worldwide from September and cost around US$430. Toshiba has delivered a handful of promises that should mean some interesting gadgets in the coming months. For a start, the company's long-delayed DMFC (direct methanol fuel cell) should be out before the end of September. The first DMFC product will be a portable charger for gadgets and Toshiba plans to follow it with DMFCs embedded in devices themselves, such as cell phones and laptops. Also due soon are more low-cost laptops. Toshiba will expand from 4 models to 6 models the number of sub $599 computers it offers. And finally Blu-ray Disc players and laptops are in the cards. Yup, Toshiba, promoter of the failed HD DVD format is finally getting behind Blu-ray Disc and we should see products before the end of the year.